What Do Games Give to Science? Games take quite a bit from science, but what can they possibly give back? It's no secret that games owe a debt to science and technology. Not only are the little gizmos and gadgets we use to play them technological marvels, but science and scientists have their place in games as well. 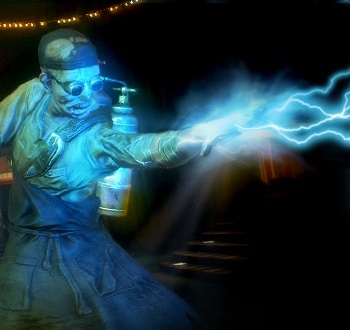 Characters are scientists - Dr. Light, Professor Oak, Dr. Gordon Freeman, to name a few - and science is a weapon in games like BioShock. But as Jacob Aron muses in Issue 242 of The Escapist, what do games like Braid and Half-Life 2 teach people about science and scientists? What do games give back? Half-Life 2 improves on its predecessor in many ways, but one of the game's less talked-about features is its deeper portrayal of scientists. Valve focused heavily on facial-modeling and narrative to create a world populated with well-rounded characters, and barring Gordon Freeman (who remains an empty shell for players to occupy), the main cast of Half-Life 2 are all believable people with unique personalities. Dr. Isaac Kleiner, with his bald head, large glasses and yes, lab coat, is a typical eccentric. His lab is messy, his equipment always breaks and he keeps a defanged headcrab as a pet. He's a stereotype, but one with strong feelings beneath his geeky exterior. His laboratory bulletin board proudly displays a childhood drawing by Alyx for "Uncle Kleiner," while a defaced photo from his Black Mesa days attempts to erase Dr. Wallace Breen, the oppressive ruler of City 17. Dr. Kleiner may be absent-minded, but that doesn't mean he lacks a heart. To read more about the debt games owe to science and how they can slowly pay it back, read "Lab Coats and Lunatics" in Issue 242 of The Escapist.